Burton IPA aged for 6 months on Brandy wood and then blended back with straight Burton IPA at the ratio of 1/3 wood to 2/3 normal IPA. 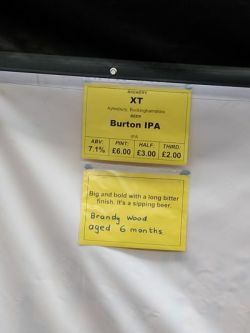 Cask at GBBF '18, day 2, 08/08/18. Lightly hazed mahogany brown with a decent beige head. Nose is booze stained oak, dark fruit rinds, sweet malt base, candied orange peel. Taste comprises more oak, bitter orange, toffee, brandy snap biscuits, spruce, caramel. Medium plus body, fine carbonation, semi drying close with a light boost and some background balanced hop bitterness. Solid stuff. 8Aug2018 Sweet apple brandy, sweet malts, bitter oak, alcohol. Hazy, dark brown, small, frothy, beige head. Light bitter. More bitter, dark malts, oak, brandy, alcoholic apple, soft carbonation, medium to full bodied. Decent, a tough too Intense on the apple brandy. Cask at GBBF18 - Wednesday session, Kensington Olympia. Cask at GBBF 2018. It pours clear deep brown with a small bubbly white head. The aroma is sweet, oily, tangy, orange marmalade, kumquat, oily, cointreau and earth. The taste is dry, bitter, oily, earthy, brandy, slick, chewy, tannin, earl grey tea, spice, warming alcohol and booze with a drying finish. Medium body and fine carbonation carbonation. Chewy and hearty. Funstuff. GBBF Day 2. Cask. Hazy amber beer, decent bubbly pale cream colour head. Smooth and semi dry palate, reasonable fine carbonation. Dry malts, light dry wood. Mildly bitter toffee. Brandy comes through, light but clear. Marmalade hops bring up the rear. Mild spice too. Interesting and drinkable.